If you want our attention, you have to push the envelope because everyone is fighting for it. How did the desire for information turn from the essential to the trivial? When did headlines begin to grab, formulate and declare relevance? Maybe reality TV is to blame. 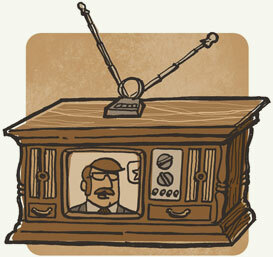 Once seen as a trend, reality TV is now more pervasive than the coverage of live sporting events. The day to day antics of socialites and washed-up rock stars keep us on the edge of our seats. These days, news outlets seem to employ more creative writers (marketers disguised as news producers), rather than traditional journalists. Yes, we love drama. If the stock market was down 100 points today it suddenly becomes the trading session that saw a “sharp selloff” or a “market meltdown.” If gas prices went up, drivers experienced more “pain at the pump.” It appears that the concept of a slow news day may be a thing of the past. Surely, the numbness of this day to day clutter has given rise to a sort of “cried wolf” condition. Perhaps the problem lies with an overly dramatic information overload. What news is real and relevant? Which is pure spin? Weeding through the fluff to actually find significant details can be exhausting. So why do it? Regardless of the topic, the objective of the media remains the same: keep the readers’, viewers’, or listeners’ attention for as long as possible. That’s the simple prescription that forces organizations to push the limits far into the world of promotion, misrepresentation and dare we say “opinion.” This is where that gets dangerous. All news affects our daily lives, some more so than others. Financial media outlets today are allowed to take considerable artistic liberties with the way in which they deliver stories. The news that they report plays to our emotions primarily because it affects our wallets. Few have the emotional fortitude and financial experience necessary to recognize the “RECESSION ON THE HORIZON?” headline, and comprehend that the media isn’t predicting another recession; they are merely touting the possibility of one (something that they seem to do daily). This appears reckless behavior on their part, yet they would declare that because we placed a question mark at the end of the statement, they are not making any biased predictions. It’s not the intent of media outlets to install panic, or encourage irrationality, but simply to keep you from changing the channel. A negative side affect of clever marketing. Oops. Sorry. With so many points of contact, tuning out is highly unlikely. It’s probably more feasible to recognize media intentions and hold a responsible amount of prejudice against believing everything that you read in the newspaper. Look out for overtly used adjectives and exclamation points intended to dramatize a topic. With regards to predicting the future of financial markets, be weary of those who speak in absolutes. It is perhaps one of the most dangerous things a commentator can do, and it occurs on a daily basis. Investors could do themselves well to see the media for what they are: a powerful tool for the distribution of information and awareness. To always interpret their sensationalized messaging as dire, forces rationality to take a back seat to emotion. Content written by Symmetry Partners, LLC. Our firm utilizes Symmetry Partners, LLC for investment management services. Symmetry Partners, LLC, is an investment adviser registered with the Securities and Exchange Commission. The firm only transacts business in states where it is properly registered, or excluded or exempted from registration requirements. All data is from sources believed to be reliable, but cannot be guaranteed or warranted. No current or prospective client should assume that future performance of any specific investment, investment strategy, or product made reference to directly or indirectly in this article will be profitable. As with any investment strategy, there is a possibility of profitability as well as loss. Symmetry follows a passive investment strategy that involves limited ongoing buying and selling actions. Passive investors will purchase investments with the intention of long-term appreciation and limited maintenance. Passively managed portfolios are designed to closely track their respective benchmark index rather than seek out performance. As a result, the portfolio may hold securities regardless of the current or projected performance of a specific security or particular industry or market sector. Maintaining investments in securities regardless of market conditions or the performance of a specific could cause the portfolio to lose value if the markets as a whole fails. Please note that you should not assume that any discussion or information contained in this article serves as the receipt of, or as a substitute for, personalized investment advice from Symmetry Partners or your advisor.